When I saw the Groupon for Learning 2 Fly, I knew I had to try this out! I had seen it done a lot in Vegas and knew that it required a lot of upper body strength, something I lacked immensely, but I wanted to try it all the same. Once I entered the building I was in awe of my surroundings. The walls were covered in bright colors as various brightly colored silk ribbons hung from the ceiling under thick bright blue mats. It was so warm and inviting! I was also given the rules once I entered. The #1 rule is you can’t say the word “can’t” or any other negative words describing your inability to do something. You must always use positive sentences stating that you will improve with practice or you have to do 10 push-ups. My kind of class! Although I learned the rules because I broke the first one right off the bat saying the word “can’t” when trying to figure out how to do the first exercise. You see, everyone else had been taking the class for a while and were able to climb the silk ribbons with little effort. I couldn’t even get off the ground for more than 5 seconds! This was going to be a very long hour…. However, much to my surprise the instructor was kind and took pity of my lack of upper body strength and gave me exercises that I could do. Sweaty immensely as I struggled to get into the first position, I managed to pull myself up and stand within the ribbons! GO ME! I was so excited and proud! I could fly like everyone else after all! 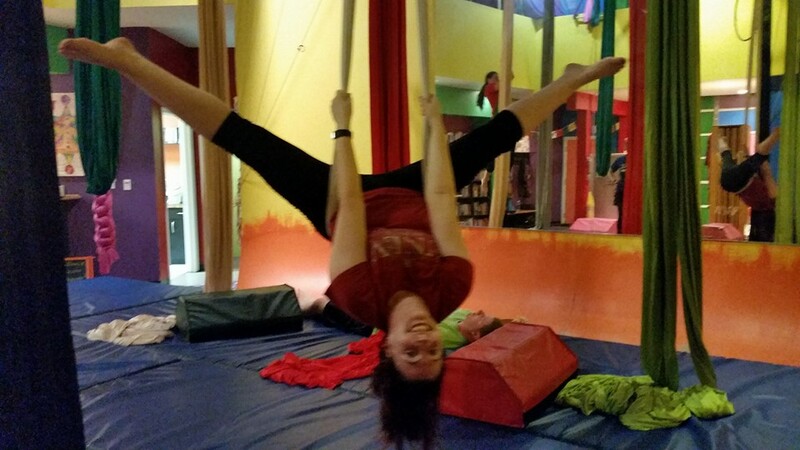 She also taught me how to hang upside down, ha! After finding about 3-4 positions that I could do I could easily see how people loved it! Who doesn’t want to fly?! So even though I was nowhere near climbing to the ceiling or doing many of the other positions, my body was stretched and worn out giving me one heck of a workout without putting too much stress on my body. So glad I gave it a try! And I made a few new friends while I was at it. I suggest you try to fly as well! With the Learning 2 Fly, you had the option of taking two classes. Someone had mentioned trying the Yoga class on Sunday afternoons. Intrigued to see this new view of yoga, I signed up for my second class the following Sunday. Once again, I found myself in the brightly colored room that had every color of the rainbow and then some! It’s fun just standing in such a happy colored room. Having a new found love of yoga I will admit that I enjoyed the freedom that the silk ribbons gave my body as I did the positions that were given. Your spine truly felt longer as you sat upside safely and securely in the ribbons. The instructor even told us that she has grown 1/2 inch since she started teaching! We did familiar poses and poses specifically designed with the use of the silk ribbons. Some felt good. Some I struggled with. However, I was able to do much more in this class. So if you’re lacking in the upper body strength like I am, then I suggest doing the yoga class a couple of times first. It was easier on the body and self-esteem personally.